every Wednesday at ​6:00 p.m.
Bells have been around for thousands of years, however the sets of handbells we are familiar with today originated in England, around 1700. In 18th century England, tower bells would be rung in patterns by a team of townspeople in a practice called 'change ringing'. However, practicing these change ringing patterns meant that the entire town would have to listen. 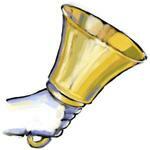 A need arose for practice instruments – handbells. Change ringers could now practice their patterns indoors with sets of handbells. Fast forward to the 20th century: handbell companies begin to market their instruments to churches. Handbell choirs become popular, handbell music is written, and new handbell techniques are invented. Handbell ringing is an exciting, collaborative, and musical experience. St. Paul Lutheran Church offers a fantastic opportunity to learn more about these unique instruments! If you are interested in ringing at St. Paul Lutheran Church, please contact Music Director, Michael Kutch, at mrkutch44@gmail.com or by phone at 269-953-2050. We look forward to ringing with you!